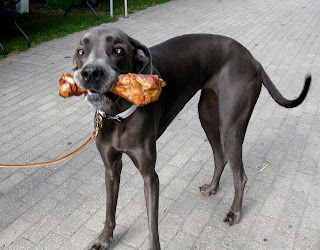 Ever heard that saying: "like a dog with a bone?" Sometimes I read one of these Tire Swing Stories after I've published it, and a part of me cringes. I want to go back and fix something. I have to stop myself. I have to remind myself that the whole point of this blog is that the stories are spontaneous. Raw. No changes, no obsessing over this comma, or that word choice. Once a story is out there, I have to let go. That's really hard, but I'm working on it. What about you? What do you have a hard time letting go of? Have a releasing weekend, story-makers. See you back here on Monday. lovely Britt. I recently posted a blog entitled 'letting go'....it's definitely that time of year of accepting, and relaxing into what is, not what should be, very difficult, very simple, very powerful.